A SURVEY commissioned by the BPMA has shown that like the rest of the world, the UK is a nation of freebie hunters, and that brands who use promotional products as part of the marketing mix will reap the benefits. The survey questioned 1,000 men and women. Distributors, like myself, that recommending particular types of merchandise to brands and end users noted that three in 10 consumers said they had purposely changed a regular brand in order to receive a promotional product. This is good news! Nearly half of those questioned (48%) would switch their brand for cooking accessories, while nearly 42% would switch for a coffee mug. Other items that can persuade consumers to change brand include fizzy drink-branded glasses (39%), a cuddly toy, such as the puppy associated with a well-known toilet roll brand (34%), the meerkat toy that was made popular in a recent advertising campaign (34%), a cosmetic purse or tote bag (30%) and the monkey toy associated with a familiar tea brand (28%). Men are most likely to switch their brand for a coffee mug, while women would switch their brand for cooking accessories. Of the promotional products that consumers have and use, 62% said they had a pen, 35% a mug, 33% a keyring, 25% a T-shirt or sweatshirt and 25% a drinking glass, with other items of merchandise kept and used including USB sticks, bags, caps and notepads. The reasons why consumers keep promotional products will be familiar to distributors, with 82% of consumers saying they keep them because they are useful, 24% because they are relevant and 20% because they are good quality. Interestingly, over a quarter (26%) keep them simply because they are a novelty. The power and attraction of promotional merchandise is clearly demonstrated in the results of the survey, with almost a sixth of consumers saying that they would use “devious means” – such as giving out false personal details or gaining uninvited entry to a venue or event – to get an item. The importance of usefulness when selecting a product again comes to the forefront, with almost two thirds accounting for their underhand behaviour by the usefulness of the product. The results showed that the most popular item consumers are devious about is free branded toiletries, with a third (33%) conning their way into receiving them. Drinking glasses are a popular freebie with men, with two-fifths using devious means to secure one, while a quarter of women have been deceiving to bag a free soft toy. The places where consumers have or expect to pick up promotional products was highlighted, with 80% saying they would at exhibitions, 60% at roadshows, 49% in hotel rooms, 38% in banks, 32% in hotel receptions and 31% at car dealers or garages. Looking at branding on promotional products, nearly half (47%) said that “significant” branding was acceptable, whereas a third (33%) stated that branding should be “subtle”. While it might be expected that younger people would be more fussy about the brand on a product, in fact the results showed that the reputation of a brand would sway over three quarters of 35 to 44-year-olds (77%), whereas half of 18 to 25-year-olds would not be affected by this. In the current difficult economic climate, nearly three-fifths of consumers said they are more likely to keep freebies than before the recession. 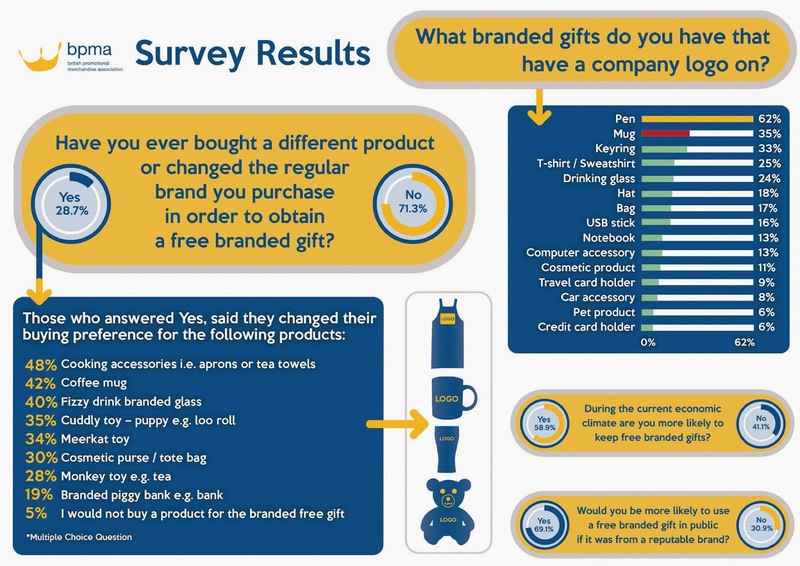 What’s more, one in 10 consumers said they would give a free branded product as a gift to a friend or family member – again showing how product choice can help to raise brand awareness among not only the direct recipient, but among wider friends and family as well. Gordon Glenister, Director General of the BPMA, said: “The study clearly shows why promotional merchandise remains popular with brands and end users. “If the right product is chosen to suit the target audience, then it is desired and kept by them, giving ongoing brand exposure.